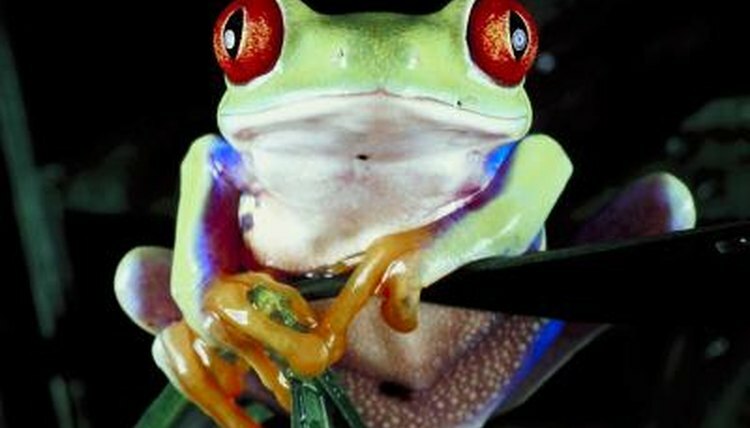 Red-eyed tree frogs are endemic to Mexico and Central and South America. These nocturnal amphibians prefer lower-elevation rain forests and rarely come down to the ground. It is possible to keep one as a pet, but you must re-create his natural habitat as faithfully as possible. Pet supply shops will have all the materials you need to make your red-eyed tree frog comfortable. Get a standard all-glass tank or terrarium. All-glass tanks are easy to clean, and they retain heat and humidity well, necessary for recreating the red-eyed tree frog's natural habitat. Red-eyed tree frogs need plenty of space to move around without getting hurt, so choose a tank of 20 gallons or larger for one or two frogs. More than two require a larger tank. A large tank will also accommodate the surroundings your frog will need to feel at home. The terrarium should be tall, so your red-eyed tree frog can climb, and should have a screen or mesh lid. The screen keeps the terrarium properly ventilated. Add substrate to the bottom of the terrarium. It should be substrate that retains humidity and is easy to clean, such as peat moss, coconut husk fibers, cypress mulch, orchid bark and clean dirt. Some people even use moist paper towels. Place real or fake tree branches and plants into the terrarium so your frog has something to climb and in which to hide. Secure the branches and plants so they don't fall over on your frog unexpectedly or when he tries climbing up them. Choose plants with large, broad leaves such as ferns. Choose from ivy, bamboo, cork bark and driftwood so your frog has plenty of perches. Keep the terrarium humid -- about 70 percent humidity. To keep the terrarium humid, place a large bowl of water at the bottom of the tank. You must mist the tank at least twice a day, every day, so either use a spray bottle or install an automatic reptile misting system. The latter works best in cases whereby owners must be away for extended periods of time. Purchase a hygrometer at a pet supply shop. It is like a thermometer, except it measures humidity levels. Shops also offer combination thermometer/hygrometers that can control temperature and humidity levels automatically. Ask at the pet shop about them. Temperatures during the daytime should be between 75 and 85 degrees F; at nighttime they should range between 65 and 75 degrees F. To achieve these ranges, use a heat lamp outside the tank, affixed to one side of the screen on top of the tank, or place a reptile heating pad beneath the tank. If you use a heat lamp, keeping it on for about 10 to 12 hours will be sufficient to keep temperatures stable. The amount of time does depend on what climate you live in, how warm your home is and whether the tank is by a window that gets lots of sun.  Clean and change the water bowl daily. ⚠ Never use heat rocks. They will burn your frog. ⚠ Do not handle your red-eyed tree frog too much. When you do, wear latex gloves to protect you from salmonella and to protect your frog from the oils on your hands. ⚠ Even if you wear latex gloves, always wash yours hands before and after handling your frog.